A wide range of PEFC-certified timber and sustainably-sourced forest products are now eligible for Leadership in Energy and Environmental Design (LEED), which promotes sustainable forest management and supports Britain’s green building movement. The British construction industry is one of the largest buyers of timber products: by choosing to use PEFC-certified timber, it can influence demand and promote the global use of sustainable wood in building. Whilst the aesthetic qualities of timber are desirable, it also boasts a lower carbon footprint than other construction materials and a wealth of additional environmental benefits. The use of renewable, recyclable timber in construction can help to address pressing issues such as climate change and urbanisation, for instance. This includes universally recognised voluntary forest certification standards, such as PEFCs, which offer evidence and assurance that wood derives from responsibly-managed forests. 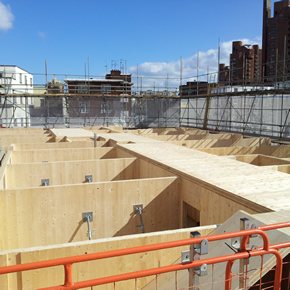 Using PEFC-certified timber can help projects to meet Passivhaus performance levels and achieve both Excellent and Outstanding BREEAM ratings. It also plays an important role in satisfying the requirements of Part L and Part E of the Building Regulations. It is accepted globally in different green procurement schemes, such as the USA’s National Green Building Standard and Green Building Initiative, Canada’s Build Green and the Singapore Environment Council. Together with industry and private sector responsible sourcing initiatives, green building standards assure forest owners that their investment in sustainable forest management is valued; this is essential in driving demand for certified timber.